San Francisco Bay Area voters approve bold new investments after housing advocates ignite successful electoral strategy. The San Francisco Bay Area is known for innovation, political action, and extreme housing costs. In 2016, voters and nonprofits were able to put the three together to win $2 billion in new investment at a critical time. Bay Area job growth and global capital have intensified housing pressure in the nine-county region. Tech companies flood the real estate market with dollars that long-term residents simply cannot compete against. One county gained 50,000 new jobs in five years while building just 3,000 new homes. Teachers, first responders, and essential workers can’t live near their jobs, which puts additional stress on transportation systems. Voters saw this problem clearly in 2016. They told pollsters that the No. 1 issue they wanted leaders to address—above schools, safety, health care, and even traffic—was affordable housing. But where could investment come from? California’s governor and legislature had taken away $1 billion in annual funding for housing for low-wage workers, seniors, people with disabilities, and veterans by eliminating redevelopment agencies. Coupled with federal cuts, some counties had an 89 percent reduction in affordable housing investment. The Non-Profit Housing Association of Northern California (NPH) has advocated on behalf of the Bay Area affordable housing industry for nearly 40 years. In 2014, the board hired Amie Fishman as executive director because of her record at East Bay Housing Organizations, where she led groundbreaking campaigns and initiated an innovative resident organizing program. With support from the board and this new leadership—including hiring me as NPH’s first political director—the organization launched a political program with strategy, data, and resident mobilization at the center. NPH conducted a short-term pilot program among likely voters living in San Francisco affordable housing developments during the 2015 mayoral election. With support from the California Housing Partnership, NPH matched a list of subsidized apartment addresses to California’s voter database and then shared targeting lists for clusters of likely voters with property managers. In an off-year municipal election, low-income, senior, veteran, and disabled affordable housing residents voted at nearly the same rate (43.3 percent) as the general electorate (45.5 percent). This turnout was a testament to the strong community organizing history and capacity of San Francisco community development organizations. It was also a roadmap for victory in other counties. This model—strategy, data, and resident engagement—offers a powerful opportunity for the future. Armed with confirmation that affordable housing residents can affect elections, NPH worked to build a regional voter database for 2016. Funding from the San Francisco Foundation allowed development of special algorithms and queries. There was a steep learning curve in translating the data, but NPH discovered more than 52,000 registered voters were living in developments managed by its members. NPH rolled up its sleeves to develop programs that would grow its base, inform residents, and increase turnout. NPH began convening resident service directors to discuss voter registration and engagement potential. It first put a call out to members: “Whether you are called service providers, community engagement, or property management—we want to talk to the folks who work with residents directly.” By casting a wide net, NPH was successful in bringing to the table a wide variety of members with opportunities to engage residents. The community convened to share best practices and recommend programming, including how to adapt voter registration and voter education programs in order to preserve resident privacy and trust. Subsequent meetings included message training, legal considerations, and success stories from practitioners. Many organizations had ongoing voter registration efforts, but reviewing hard data about the number of registered voters by property revealed opportunities to broaden our electoral base, expand to new locations, and improve existing programs with low rates of registration. Measuring is the first step in identifying how to improve, and NPH members responded with voter registration campaigns in many counties, with striking results where there were ballot campaigns to increase housing funding underway. In San José, First Community Housing hosted multiple trainings for service providers to engage with hundreds of residents in conversations about housing needs. One NPH member, EAH Housing, trained maintenance personnel, knowing that they are trusted community members, to circulate registration forms. (NPH has no conclusive data about the results of this tactic, but some maintenance supervisors updated their own registration because the forms were readily available.) Community partners, including Pacific Institute for Community Organizing and its affiliate Faith in Action, helped NPH deliver trainings and webinars. Following lessons learned during the 2015 pilot program, NPH made it a priority to provide voting information in residents’ home languages. 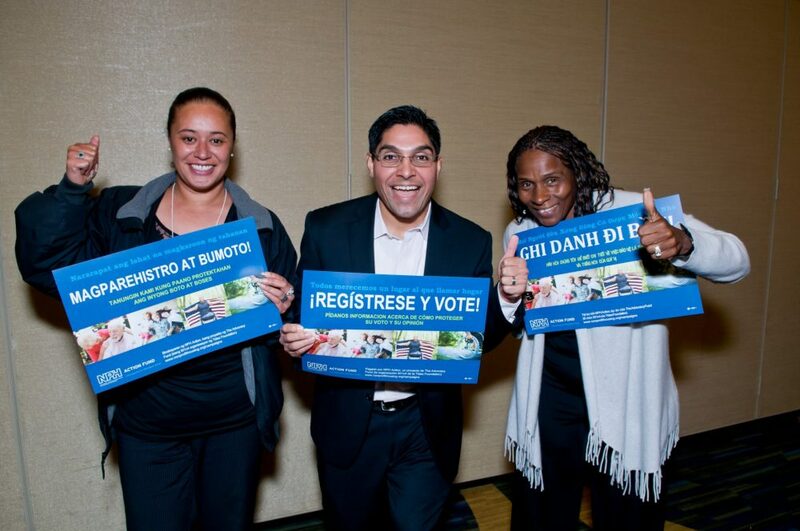 The organization distributed 11,000 posters and flyers promoting registration and voting in Arabic, Cantonese, English, Korean, Spanish, Tagalog, and Vietnamese. Onsite staff could order materials directly from NPH’s website and orders were shipped daily. With resident engagement underway, the organization dove deeply into coalitions in three large Bay Area counties to determine public support and help shape the campaigns. NPH and its members invested in polling voters in each county, sometimes more than once, to find the strongest arguments and most persuadable voters. While NPH had conducted conceptual planning in the past, these polls were focused on direct questions to voters: Will you vote “yes” for this measure? The nonprofit built stronger and sometimes new partnerships with local leaders and advocates to ensure measures were placed on the ballot, and earned unanimous votes by each county’s board of supervisors. It reached out to business, labor, environmental, health care, and social service organizations. It targeted organizations that participate in electoral politics and could bring their own resources to a campaign, beginning with the elected officials who would have to vote to place measures on the ballot: county supervisors. The role of residents and advocates in securing supervisor support can’t be overemphasized. While NPH had strong polling and powerful political leaders on board, the compelling personal narratives of current residents who benefit from affordable homes and want more for their community drove the meetings’ emotional high points. Some speakers, who had once been homeless, were currently employees at affordable housing developments. Their stories became a critical part of campaign communications, including media outreach, mail, and digital storytelling. Specifics of the measures were shaped by community experience and expectations in each county. Leaders in San José (Santa Clara County) were focused on the rapid expansion of homelessness and they developed a policy with an emphasis on the creation of affordable housing for chronically homeless families and residents. In Oakland (Alameda County), the eviction epidemic, which seized the homes of thousands of families in historically African-American neighborhoods, was a motivator to create affordable rentals, a first-time homebuyer program, and develop an Opportunity Fund to support additional local needs. In San Mateo County, elected officials and voters (as seen in two rounds of polling) did not have the appetite for a bond and the two-thirds vote threshold that would require. So instead, NPH organized support for Measure K, an extension of an existing sales tax measure that provides funds for developing affordable housing. As NPH’s political director, I spent a few days each week providing strategic, logistical, and training support to NPH members, campaign consultants, and elected officials. Each campaign was managed by a professional consulting firm and staffed by field organizers, but NPH’s housing community was the engine. Evelyn Stivers, executive director of the Housing Leadership Council (HLC) of San Mateo County, took a sabbatical to manage the Measure K campaign. Leslye Corsiglia of SV@Home (Santa Clara County) demonstrated boundless talent for securing endorsements as well as her past experience in field campaigns. East Bay Housing Organizations (EBHO) and NPH co-led a campaign office for get-out-the-vote activities on the last four days. The three campaigns were properly resourced. More than $5 million was raised and spent on direct mail, media, television advertising, and voter contact. NPH’s Fishman led a fundraising team that worked the big, bold action message to ensure that the housing community delivered on commitments for critical resources. NPH, a 501(c)3 charitable organization, contracted with The Advocacy Fund, a project of the Tides Foundation, to add 501(c)4 reporting capacity and a general-purpose ballot committee as required by California campaign finance law. NPH made good use of diverse resources to build its base support. The Alliance of Californians for Community Empowerment (ACCE), a valuable community partner, made direct calls to targeted voters in the summer, asking about housing concerns and sharing information about the ballot in the fall. Sophisticated predictive dialer equipment was provided by ACCE as well as Working Partnerships USA, a labor affiliate, and Clifford Moss, a campaign consulting firm. A mix of volunteer and professional callers reached more than 50,000 voters in Santa Clara County and 25,000 in Alameda County. In the final four days, NPH was astounded by the number of executive directors and housing developer employees who stepped forward to make calls and drop door hangers. While the vote margins in Alameda and San Mateo counties overwhelmingly supported the respective county measures, it took two weeks of counting mailed and provisional ballots in Santa Clara County before victory could be declared with certainty. With a margin just over 8,000 votes, the votes of 14,000 Santa Clara residents of affordable housing were decisive. It was a good election day for housing measures beyond the Bay Area as well. The City of Los Angeles passed Measure HHH, a $1.2 billion bond for homelessness reduction and prevention. Some rent stabilization measures supported by EBHO and HLC also passed. The Bay Area affordable housing community has moved from conducting political action through gatekeepers and lobbyists to building an electoral base and direct capacity. Once NPH’s final data is imported with new partners and contacts from these campaigns, the organization’s contact list will grow as much as 20 percent. New capacity for resident registration and engagement, renewed and refreshed community partnerships, and a reputation for keeping promises and delivering results on the ground will support the nonprofit’s legislative program and assistance to members in local jurisdictions. This model—strategy, data, and resident engagement—offers a powerful opportunity for the future. Where was the funding from ? The state and country in debt so doesn’t Make scenes ?